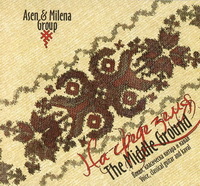 The first album of Asen&Milena Group "The Middle Ground" was released in June 2011. Where can you buy the CD? To buy the CD directly from the band - in/ outside of Sofia and abroad: please send an email to info@asenmilenagroup.com. Best price and signed (optional)! > Tea House, Sofia, 11 Benkovski str. > Music shop of the Union of the Bulgarian Composers, Sofia, Ivan Vazov 2 str. (to the right of National Theatre Ivan Vazov).